Last year, I drove from Boston to Rhode Island to watch both the Eastern Conference Final and the Stanley Cup Final Game 7s. I figured that if I had the chance to watch my favorite team growing up win a championship, I would want to witness it with my dad, the person who influenced me to fall in love with this crazy sport. Of course, the Bruins won both games and I watched it all in with my dad and younger brother right beside me. Somewhere amongst the celebrations, the hugs and the complete shock, I recall my dad telling me to take everything in that’s happening, because there will never be another run quite like the one we had just saw. Think about it: a total of 25 games including three Game 7 victories, two series of coming back from a 0-2 deficit and a first round victory that was clinched without scoring any power play goals. The 2010-11 Boston Bruins weren’t just good, they were lucky and every single fan who watched any of those games could have told you that. It was magic. On Wednesday night, Game 7 of the Eastern Conference Quarterfinals between the Bruins and the Washington Capitals, that same mentality of thinking that the team was special, perhaps invincible, last year in the postseason ended up becoming the worse possible thing for every Bruins’ fan’s psyche. There were warning signs: the endless statistics on NESN of players like Rich Peverley and Tyler Seguin who were both 3-0 in Game 7s (all last season, even though Seguin didn’t dress in Game 7 against the Canadiens), the way that the Caps outplayed the Bruins throughout the entire series and the lifeless two-minute power play to close out the third period. This wasn’t last season. The Bruins may have had an almost identical roster as 2010-11 but the same? Hardly. That’s not to say that the Bruins weren’t better or weren’t worse this season; they were just okay. Not great, not bad, but good. The erratic production throughout the season proves that. Throughout the first round of the playoffs, everyone was waiting for the Bruins to snap out of it, to magically become the team that they were last season. It never happened. Though each of the seven games in the series were decided by one goal, a first in NHL history, the Capitals carried the play. They had a young goaltender in Braden Holtby who was a stud all series and altered their game to fit the Bruins’ style of aggressive, grinding hockey. They were the team the Bruins should have been. Now it’s not to say that the Bruins weren’t playing good hockey because at times, they were. Tim Thomas had his moments of superhuman-ness while we saw strong, dedicated hockey from Dennis Seidenberg, Zdeno Chara and Patrice Bergeron. There were of course some non-factors, players who never really showed up in the series like Brad Marchand, Milan Lucic and David Krejci. There were also injuries to key players with Nathan Horton and Adam McQuaid being out. To add on, Bergeron, who’s been great on faceoffs all year, stopped taking them in Game 6 because of an injury too. After Joel Ward scored the game-winning goal in overtime for the Capitals, the Bruins looked disappointed but also, as someone pointed out, a little relieved. 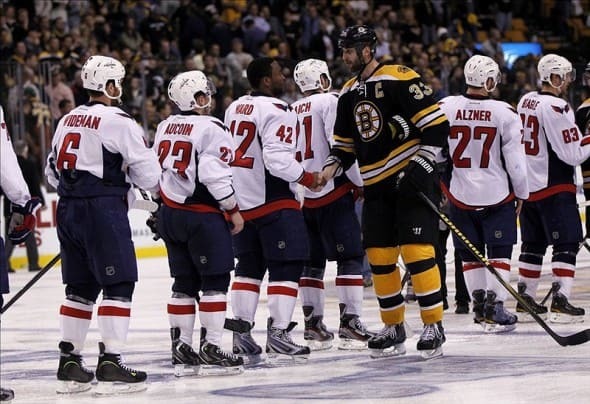 Few would have thought that the Capitals would cause the Bruins this much distress but after a grinding series with four overtime games, it became apparent–the Bruins were just gassed. And now the offseason begins. As do the questions. Did we just witness the last of Tim Thomas in a Bruins uniform? Does Tuukka Rask get re-signed? Will the Bruins go after a marquee free agent? In time, all will be settled. The dust will clear and the pain from an overtime loss in Game 7 will heal–a pain that no one Bruins fan could remember. All because of last season. In Boston, hockey will be stored away for the summer next to the sleds, shovels and snow blowers in the shed. It’s the earliest that the Bruins have been eliminated from the playoffs since April 19, 2008 when they lost a Game 7 against the Montreal Canadiens. There won’t be another parade, there won’t be another June 15 and there won’t be another team like the 2010-11 Boston Bruins. After Wednesday night’s loss, now everyone knows it for sure.